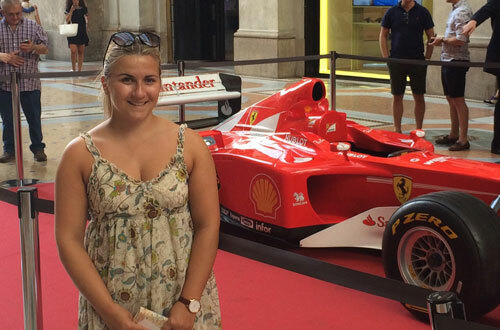 Helena Hicks, (BA Journalism), talks about her love of F1 and lifts the lid on the challenges she has faced as a woman in the world of motorsport. Early morning trips to Silverstone and working with F1 stars like Lewis Hamilton and Jenson Button are not things that most students can boast. 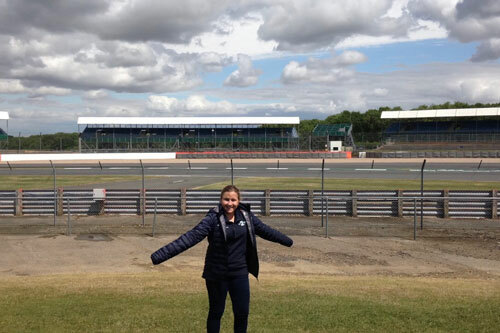 Helena, a second year Journalism student, juggles her passion for F1 with a full-time degree, a role in Autosport Magazine's junior programme and a new press officer job with the Michelin Clio Cup. Helena admits that the world of motorsport is still a man’s world, but refuses to let this deter her from making it her world. How did you get into F1? I have memories of when I was really young of walking into my parent’s room and they would always have the Australian Grand Prix on. As I got older, it was me and my dad watching it as my mum got bored, so I took over her role in the conversations about F1! When I was older and my dad started working, I would rarely see him during the week. Weekends would be the only time we had together so watching F1 was a big thing we had in common. It was great to share that experience with my dad, and we still talk about it today. Around two years ago I was looking to do some work experience, so I emailed Bradley Lord at Mercedes. At the time, I did not realise that Bradley was their Head of Communications, and much to my surprise he emailed me back within seconds inviting me to help out at a Channel 4 filming day. This was an end of season event which included Lewis Hamilton and Nico Rosberg. I had to work with both the drivers and the Channel 4 F1 news team, which included two of my idols, Mark Webber and Lee McKenzie. A few weeks later I got another email from Bradley who invited me to another event at Silverstone for a Mercedes car launch. The best thing about these events was actually putting on the Mercedes uniform, feeling a part of the team and working with around 500 F1 journalists. How do people react when they see you at the track or writing about F1? On the whole it is quite positive – I have had great experiences and the majority of people don’t treat me differently. However, there are always the odd one or two people who will call you something or say something that they wouldn’t say to a male colleague. In the paddock, I am usually the only girl and sometimes you get off looks, it does feel like I am in a man’s world. This actually encourages me though, as when people tell me I am a girl and I cannot like racing, it makes me like it even more as I want to prove them wrong! How should the motorsport industry look at issues around gender inequality? The gender pay gap in F1 was quite shocking. There was a 51.9% pay gap between men and women at Formula One Management, and a lot of the individual teams had similar statistics. It is discouraging for women wanting to get involved in F1, as there were even a few teams who only had 1% of women in managerial roles. There is a lot being done however, Susie Wolff, who is a former racing driver has set up an initiative called ‘Dare to be Different.’ This is a scheme which encourages young women at grassroots levels to get involved with motorsport and has just recently branched out to Germany and Australia. I have got to travel with Susie and watched her give talks and hold events at schools which promote motorsport to young women and I know from experience that this helps. The Fédération Internationale de l'Automobile (FIA), which is the governing body for motorsport, is also trying to get more women involved. Schools can also encourage young women to study in technical areas like science, maths and engineering – education needs to show that women can do these subjects too. The car racing industry is so unique and every day is different. I think that showing women that they are welcome in motorsport is the first step. What is an average day for a F1 journalist? I start by checking my emails to see if there is any content I can use for my blog. My blog is two years old and it has gone from me writing about my passion for racing to now interviewing racers and covering events like car launches or endurance races. When I am at the track, things get a lot busier! If I am there as a journalist, I have to get quotes from the drivers and quickly turn that into something which can be published. If I am there as a press officer with F1 or a team, I manage their social media, arrange the drivers interviews and have to get stories ready which we can then send out to the press. Just last weekend I was at Silverstone and I was working from 7am to 10pm at night – there is always a lot to do! How do you balance your studies with your work around F1? It can be very challenging, as my degree is very coursework heavy. However, my degree must come first, as it is the stepping stone for a job in journalism which is what I love doing. I sometimes get to use my interviews around F1 for my university work too, which is really helpful. The module I did on digital journalism at City was incredibly helpful for the first day of my press officer job, as I had been taught to understand the Twitter algorithms and Google analytics at City. My degree has also taught me different ways of how to write my stories, and this is must have skill in journalism. I would like to go into the broadcast side of F1, maybe doing video presenting or reporting. I can talk, but talking in front of a camera is a completely different game! It will be hard, but it is something that I have always wanted to do. I also always want to keep developing my writing. When I finish university, I want to be in the position where I am ready to go straight into a job with F1. What are your predictions for the new F1 season? I am quite biased as I have always been a Red Bull racing fan, especially of Daniel Ricciardo! However, I think it will be between Mercedes and Ferrari and the last two will probably be Hamilton and Vettel. I just hope to see good races and close battles really. The sport was quite dull a few years ago as it was more or less a one horse race, although now the competition is stronger, especially in the midfield teams like McLaren and Force India, it is going to be exciting! You can read more of Helena’s work on F1 at her blog.